Horizon Elite T5 – Read our full review here. With the change of the seasons comes the change of the workout routine. If you are an outdoor runner, this may mean having to rethink how and where you are going to log your miles. But never fear! When the weather outside is frightful, look no further than your treadmill to keep your fitness levels up and meet your goals throughout the winter months. We’ve put together a list of tips to keep you from getting cabin fever during your indoor sessions. Plus, try out the workouts below for a change of pace or a new, fun challenge to ensure you are getting the most out of your indoor workouts. Keep Your Mind Off the Change of Location! Your treadmill is more than just an alternative for when you can’t run outside. Here are some tips to help not only ensure you are using your machine properly, but how to take advantage of the extras. Bring your favorite route inside – Just because you are using a treadmill doesn’t mean you have to give up your favorite route. 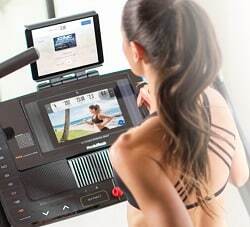 With the iFit feature on Nordictrack machines, you can run your outdoors routes inside! iFit syncs with Google maps so that you can map exactly where you want to “go” and run the actual road conditions that you know and love. 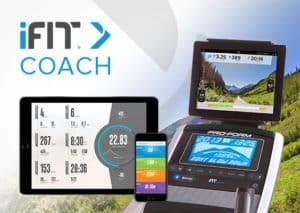 iFit Coach is a great virtual trainer right on your treadmill! Find a new destination – Why stay local when the world is your oyster? With virtual programming available through iFit and ViaFit you can choose to run anywhere in the world. These routes mimic hills and road conditions to give you a more immersive experience. A beach run in Australia may be just what you’re looking for when it’s cold and snowy outside! Simulate the road – Up the incline on your treadmill from 0 to 1%. This little change will help replicate the forward motion that you’re used to on the road. Don’t watch the clock – Staring at the clock and counting down the minutes will make your workout feel like it’s gone on forever. Instead, set your workout so you don’t need to mess with the controls, choose your favorite playlist, and make it fun! At the end of each song, check your distance and then aim to beat it on the next one. You’ll be challenging yourself while you rock out to your favorite tunes. Make sure you’re using the belt correctly – You need to make sure that you are running in the right place. If you are too close to the console it can get in the way of your arms. Likewise, if you’re too far back you’ll find that your steps get choppy as you worry about falling off the back. This is extra helpful… on Horizon machines that have different cushioning on separate portions of the belt to accommodate the various parts of your stride. 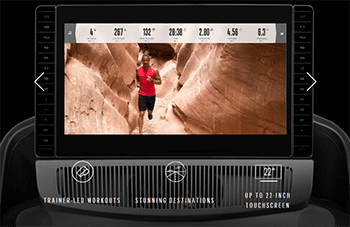 Catch up on what you’ve been missing – Take advantage of integrated tablet racks and touchscreens with Wifi to catch up on your Netflix while you run. Since most episodes last 30 minutes or an hour, you won’t even need to worry about keeping an eye on the clock! iFit Programming on the NordicTrack x11i Incline Trainer. One of the keys to successfully take your outdoor runs onto the treadmill is to recognize that things aren’t going to be exactly the same. Skip the long-distance runs that are really best with scenery. Save those for nice days when you can get outside and enjoy the distance with a view. Try out these workouts from industry trainers for a challenge with specific benefits. 3-2-1 Speed Session Workout – Developed by Lisa Rainsberger, founder of Training Goals in Colorado Springs, this is a great workout to build your speed. Start with a warm-up based on your personal ability (5 min. for beginners, 10 for intermediate and 15 for advanced). You will want to use these same times for your cool down. Hills on Hills on Hills – If you are wanting to build your strength, this workout developed by Orange Therapy trainer Michael Pieramarini, is just the ticket. 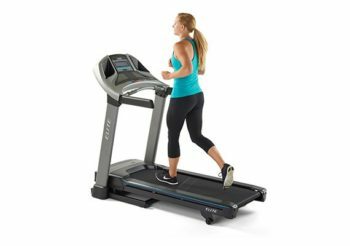 ProForm treadmills have iFit Coach Ready technology. Classic Speed Intervals – If you are looking to really burn fat over the holiday season, classic speed intervals are the way to go. HIIT sessions are another great way to ensure there’s never a dull moment when you step on your treadmill. Check out these HIIT workouts to make sure your treadmill workouts are anything but boring. Never-A-Flat-Moment workout – This HIIT workout will have your heart rate up, the calories burning, and your glutes working overtime! 3.5mph @ 7% incline: 2 min. 4mph @ 4% incline: 2 min. 2.8mph @ 10% incline: 2 min. 3.2mph @ 6% incline: 2 min. 3mph @ 8% incline: 2 min. 3mph @ 3% incline: 1 min. 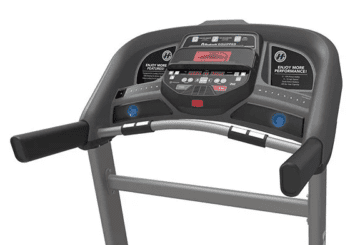 Horizon T202 Treadmill – Read our full review here. Around the World workout – This workout may be a little different from what you are used. As opposed to just running hills or speed intervals, you will actually be doing timed exercises on the treadmill to increase coordination and speed. Make sure you are comfortable with the speed on the exercises to avoid any accidents or injuries. Side-to-side shuffle (right leg leading): 1 min. Side-to-side shuffle (left leg leading): 1 min. Repeat the circuit 2-4 times, increasing the incline 2% each time. As the weather turns cooler and the days shorter, don’t despair! Your indoor workouts on your treadmill can be just as fun and challenging as your days exercising outside. Use the tips and workouts we talked about and you’ll be in great shape and ready to tackle the roads again come spring!